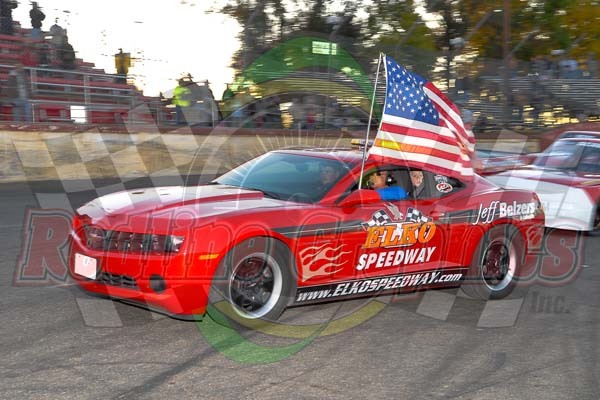 September 22, 2012 –A weekend of racing action and fundraising and awareness for ALS featured great car counts in all participating divisions and heartfelt support as the 4th Annual THUNDERSTRUCK 93 weekend wrapped up at Elko Speedway. 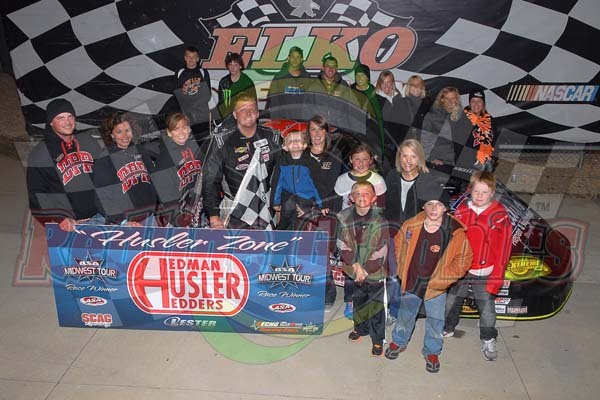 Highlighting the action were the Stars and Cars of the ASA Midwest Tour and a late race battle turned to a final turn excitement as Dan Fredrickson grabbed the lead from Jacob Goede as he claimed victory in the ASA Midwest Tour Presented by SCAG Power Equipment and Lester Buildings Thunderstruck 93 at Elko Speedway. ECHO and ECHO Bearcat Touring Star Chris Weinkauf took the lead from pole sitter Derek Lemke on the opening lap. Weinkauf soon had fourth starting Goede challenging and on lap four, Goede took command of the race. Jonathan Eilen then stepped things up as he moved by Weinkauf and pulled in behind Goede. The leaders ran together as the first caution of the race waved for Chris Wimmer, who stopped on the track with mechanical problems. When the race went back to green, Goede and Eilen continued the fight for the lead as Nick Murgic tracked down the front pair. 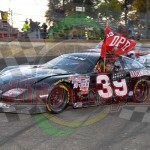 Jerick Johnson’s spin slowed the action on lap 23 and when the racing resumed, Goede continued to show the way. Molly Rhoads would bring out the final caution of the race after she spun on lap 37. Goede still held the lead, but Murgic stepped things up as he took over second, while ECHO Quick Cut Fast Qualifier Fredrickson was slowly working his way to the front. Goede extended his lead to a few car lengths over Murgic, Fredrickson, Skylar Holzhausen and Eilen just before the break on lap 61. Teams made adjustments during the 10 minute break and when the green waved, Goede had Murgic looking to the inside. Murgic was unable to pull off the pass, before Fredrickson was finally able to get by on lap 68. Goede’s rear view mirror quickly filled with Fredrickson as he sought a way around. 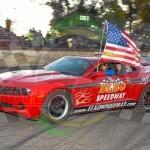 Goede held strong as he maintained the top spot over Fredrickson, while Eilen rallied to the third spot. Fredrickson tried to get under Goede and the leaders made contact several times in the final 15 laps of the race. Each time however, Goede was able to hold on to the lead. As the white flag waved, the leaders ran tight and exiting the final turn, they made contact getting Goede slightly out of shape as Fredrickson dove under and took the lead just feet from the finish line. 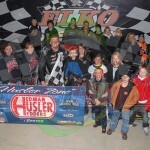 Fredrickson took home the win, his third Thunderstruck 93 race in a row. Goede crossed the line second, while Eilen held strong to finish third. “I wanted to get up there and wiggle him a little”, said Fredrickson following the race. “He did what he had to do and I did what I had to do and I won.” Goede was very frustrated after leading 95 of the race’s 100 laps. “I did everything I could, I gave him the lane, but he wanted mine,” said Goede describing the contact out of the final turn. Eilen appeared extremely pleased with his third place run as he add to his points lead heading into the final race at October Fest. “It was pretty crazy, I knew something was going to happen. They wanted to win it and I wanted to win, but we had to keep points in the back our our mind”, said Eilen. Barber and Wood led the field to green and from the onslaught, it was a side by side battle. Barber and Wood quickly distanced themselves in the opening laps of the 39 lap event. The front pair staged a tight battle as Wood finally was able to find his way under Barber on lap 25. Lapped traffic allowed Swan to catch the front pair, making it a three truck race for the top spot. Mark Rosenow and Joe Rinnartz made contact in turn three to bring out the yellow with 31 laps complete. On the restart, Barber grabbed the lead as it was game on with Wood again for the lead. A couple of laps later, Wood again moved to the front, before John Wood and Chad Knaus tangled in turn two to bring out the final caution of the race with just four laps remaining. When the green waved the final time, Jerry Wood locked down the lead as Swan pressured Barber for second. Swan would finally take second with two laps to go as Wood flew to the win. 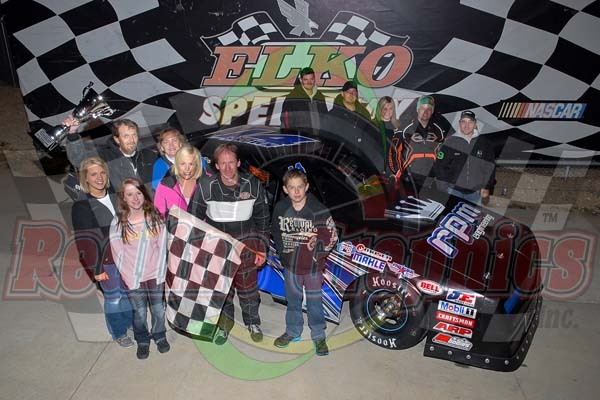 Another action packed battle racing over the two day show were the Thunder Cars who were chasing a title in the Summer Thunder Series presented by Extreme PowderCoating and Brother Jorgenson Racing. Entering the 50 lap series finale, Jacob Goede held a slim 7 point advantage over Brent Kane and as the green flew it was James Lindgren pacing the early action over Goede, with Kane moving to third by lap five. 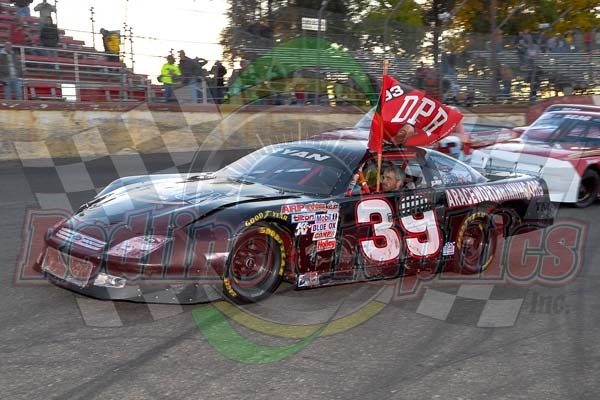 As the field continued to chase Lindgren, Doug Brown came to life and worked his way into the top five by lap 12 and then charged forward to overtake Lindgren as the field approached the midpoint, with Kane following suit on lap 26. With Brown leading Kane, the storyline seemed to be changing as Goede was then overtaken by Lindgren, Conrad Jorgenson, Ted Reuvers and Devin Schmidt shrinking his series point lead, but as Brown rolled the dominant win over Kane and Lindgren, Goede’s seventh place finish was good enough to hold on by two points to earn the inaugural Series Championship in the Summer Thunder Series. A special Thank You to series sponsors EXTREME POWDERCOATING and BROTHERS JORGENSON RACING in addition to all participating drivers and Raceway Park for a successful series. The Big 8 All Stars were also in action for a 58 lap headliner and it was a case of “home cooking” as Elko regular Jon Lemke and former divisional runner up Dylan Moore kept the fans on the edge of their seats for the better part of the action after an opening lap caution, with Moore saving his tires to pull away for the win in only his second start of 2012! 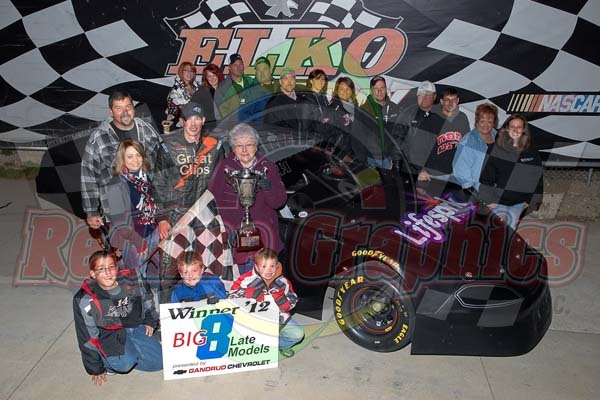 Topping off the racing during the cool weekend were the Mid Am Stock Cars and Lyle Nowak took the lead by sliding to the inside of Ryan Gutknecht on lap 13 of the 40-lap Thunderstruck feature at Elko Speedway Saturday night. He then held off Gutknecht on a restart with 13 laps remaining to pick up his second win of the season. 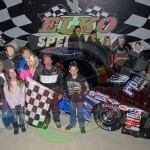 With the win Nowak unofficially took a 16-point lead over Jeremy Spoonmore who finished seventh. Gutknecht held on for second, Jack Stern was third, Jake Finney fourth and Ryan Farrell rounded out the top five. In addition to the GREAT racing action, much needed funds were raised throughout the weekend for ALS Patient Care and Research in Minnesota. A sincere Thank You from Elko Speedway and ALS/ARWW to all of the Sponsors and volunteers who helped us continue to “Race towards a cure”. 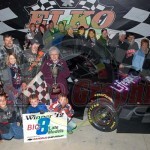 Elko Speedway will now prepare for the September 29, 2012 EVE of DESTRUCTION presented by Jeff Belzer Dodge/Chevy/Kia featuring Season Championships for the Mini Stocks and Legends Cars, plus FREE Ferris Wheel Rides for Kids of All Ages, Verticle Mischief, Alter EGO Monster Truck and the GREEN MAMBA JET CAR!!! For tickets, directions or general questions contact the Racing Office at (952) 461-7223.